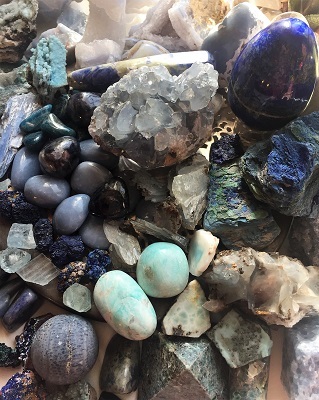 Blue stones are wonderful crystal tools for developing and enhancing psychic abilities, pursuing artistic or spiritual endeavors, and supportive for those who struggle with depression. Acknowledging extremes, blue crystals energetically support the choice of the middle way creating balance in our lives. In color healing, the vibrations of the blue color ray are said to be antiseptic and may help to rid the physical body of infections. Soothing to the nervous system, the color blue is helpful to reduce feelings of stress, anxiety, and nervousness. Physically, the color blue supports the healing of skin irritations, jaundice, reduces inflammation, and may be helpful in the treatment of epilepsy. The energies of the Blue ray resonates with the Thyroid gland. Natural electric blue colored Azurite Crystal with bright green Malachite. Lovely turquoise colored Amazonite tumbled stones from Africa. Gorgeous waxy textured sky blue colored natural Blue Calcite from Mexico. Lovely dark aqua blue natural Apatite specimens from Brazil. Wonderful soft sea green-blue colored Hemimorphite Natural Crystal Cluster on limestone matrix from 79 Mine, Gila County, Arizona, USA. Beautiful soft sky blue-turquoise colored natural Larimar crystal from Los Checheses, Sierra de Baoruco, Barahona Province, Dominican Republic. Beautiful natural teal colored Chrysocolla covered with quartz druzy from Inca de Oro, Chile. Beautiful natural teal colored Chrysocolla with Turquoise on vivid black patterned matrix from Mexico. Beautiful bright teal colored Chrysocolla tumbled stones from Peru. Gorgeous pale blue green Chrysocolla with green Malachite polished stone from Kolwezi, Katanga, Democratic Republic of the Congo, Africa. Dramatic Blues and freshwater pearl mixed gemstone necklace. This necklace consists of one strand of mixed beads: Fair trade recycled blue glass, freshwater pearls, reclaimed beads, shell, and lapis lazuli. Beautiful teal green color and smoothly tumbled Turquoise stone from Kingman, Arizona, USA. Beautiful teal, turquoise, blue, tan and brown patterned Polished Shattuckite tumblestone from Congo, Africa. Beautifully patterned Indigo Blue Sodalite polished sphere from Namibia, Africa. Stunning dark blue with markings of creamy white and grey Sodalite polished sphere from Namibia, Africa. Beautiful indigo blue Sodalite polished crystal tower with veins of creamy white quartz from Namibia, Africa.